Saint-Malo Intra-Muros, a little history! The town of privateers, the birthplace of Jacques Cartier, Chateaubriand, Lamennais, Duguay-Trouin, Mahé de la Bourdonnais, Surcouf and many other illustrious men. The streets have retained the charm of the old town with lots of restaurants, bars and shops. Ask for your “PASS AVANTAGES” at the hotel reception! 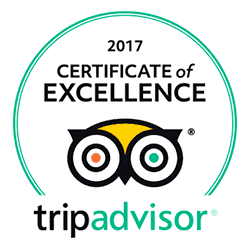 The Hotel des MArins is located at the heart of the historical town making it the best place for discovering the history and wealth of the town of privateers. Fort National: a monument and ambassador to the town, the Fort National was built by architect Vauban and can be visited by foot at low tide. The Bidouane Tower: this 15th century Fortified tower, it is located on the north-west of the enclosure of Intra-muros it regularly hosts free exhibitions. The Maison du Québec: this historical building is a reminder of the close bond between Saint-Malo and Quebec. Malouin Jacques Cartier discovered Canada in 1534 through the St. Lawrence River. The House of Poets: One of the oldest houses in Saint-Malo, dating from the seventeenth century, is today The International House of Poets and Writers of Saint-Malo which hosts many exhibitions and artists all year long. La Maison d’Asfeld: Visit the home of a privateer. Asfeld house is one of the last typical houses of the period. Nestled at the foot of the ramparts, Bon Secours Beach is perfect for water sports and the seawater pool at low tide. 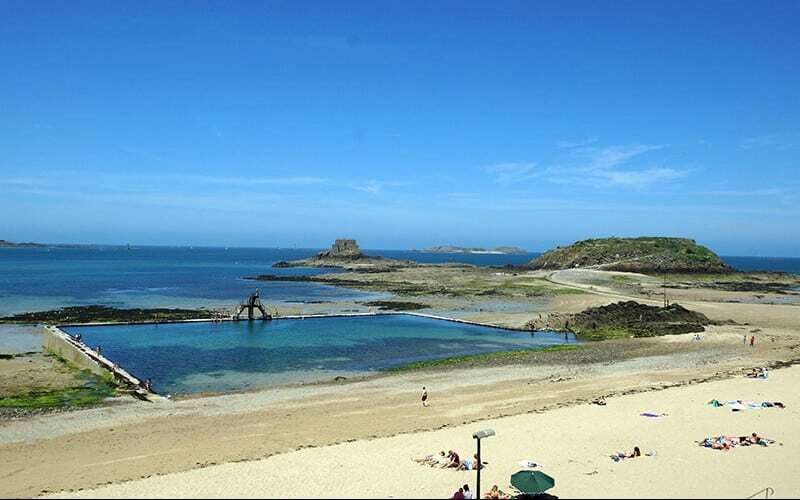 Located near the beach of Bon Secours, this beach is very popular because it is protected from the wind and offers a magnificent panorama of the town of Dinard. You will find this beach at the foot of the ramparts. 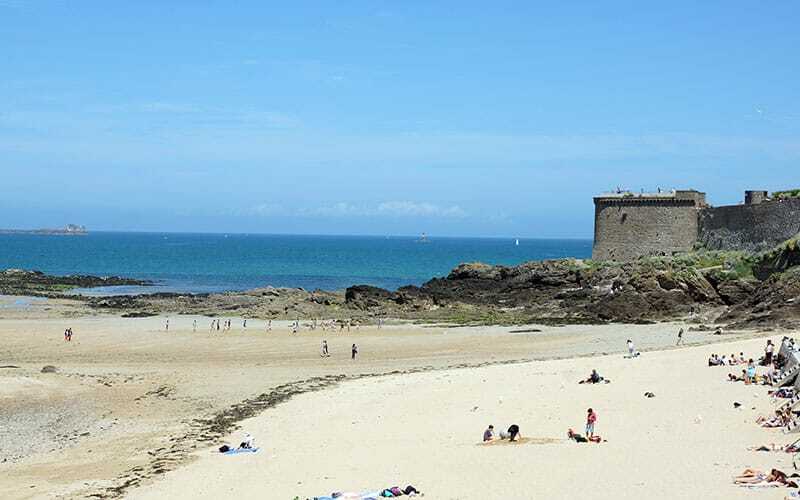 It is located next to the Grande Plage du Sillon with access to the Fort National. “Sainte-Ouine”: January and February have fun at the carnival of Saint-Malo. Winter Route du Rock: February, rock festivals in Rennes and Saint-Malo with many famous artists and new talents. Classique au Large: April, Saint-Malo’s classical music festival. Etonnants voyageurs: May, the international book and film festival, meet the artists, writers and directors of the moment. Folklore du Monde: July celebrates folk music and dance festivals from around the world. Summer Route du Rock: August, the summer rock festivals. September, the Cancale to Saint-Malo half-marathon. Christmas fair: December, enjoy all the magic of Christmas at the foot of the ramparts of Saint-Malo. 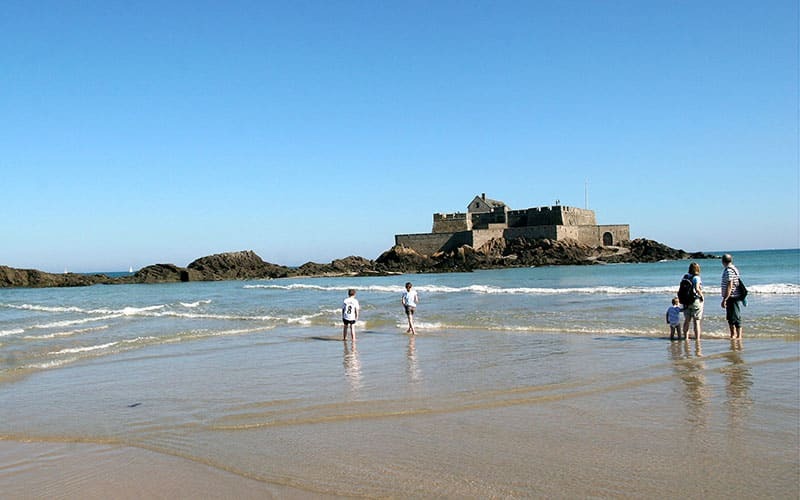 Beyond its history, Saint-Malo Intra-Muros also holds many great events throughout the year. During your stay, enjoy a walk through the heart of the old town for shopping and discovering local specialties including Bordier butter and Roellinger spices. The perfect opportunity to visit the boutiques and take home a little piece of Saint-Malo. Then, treat yourself to a relaxing drink at the Universe Bar or the Belle Epoque, very popular with the locals. Roellinger spices: In the heart of the town on rue St Vincent, the main street, discover the world of spices. La Maison du Beurre: On rue de l’Orme, visit the traditional dairy shop where cheese and butter are produced and matured by the celebrated cheese maker Jean Yves Bordier. L’Univers Bar: A traditional maritime atmosphere at this very popular bar located Place Chateaubriand. La Belle Epoque Bar: A rustic setting and a warm atmosphere, a blazing fire in the winter and sandy floors in the summer. The Sanchez: Rue de la Vieille, Intra-Muros, ice cream makers Le Sanchez have a well established reputation. So many homemade ice cream flavours to choose from….